This summer has been remarkable hasn’t it? Bar a brief period in mid-June and indeed for a couple of rather windy days 2 weeks ago it has been high pressure, light winds, blue skies and calm, clear seas since pretty much the start of May. Am I complaining? Most definitely not, as it has enabled my clients to enjoy something that 75% of them wanted to experience – lure fishing for bass in darkness. 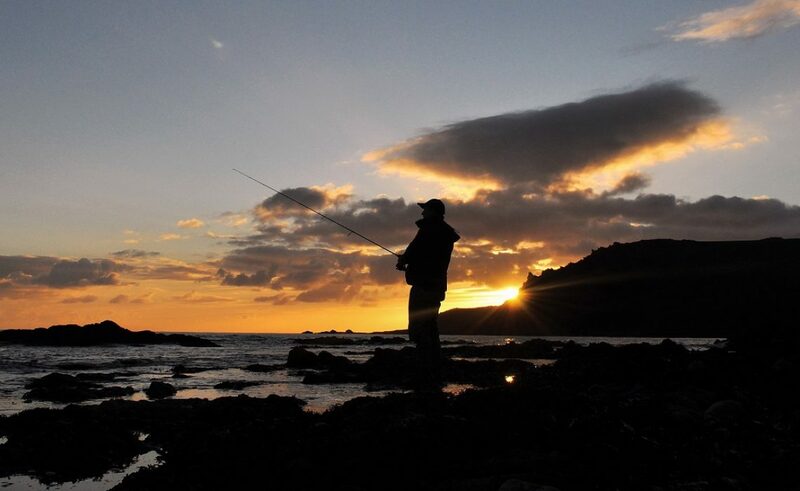 Now I love this form of fishing for a variety if reasons, but I had been missing being out on the open coast, in daylight, with some white water, or at the very least a slight swell washing some aerated water around the rocks. The last time it occurred was during the first 3 Client/3 Day Packages in June, when one of the guys (Mike) landed a dark backed brute here. So having taken a full week off of fishing and writing completely (in order to enjoy the start of the school holidays and to recharge my batteries) I was fully refreshed and raring to go as I met Trevor – a full-blown Salmon enthusiast from Somerset. I’ve been spoilt really, in relation to the regularity of the gorgeously warm and sultry evenings in which I’ve been able to guide clients this season – and this one didn’t disappoint. And by the time we’d walked the mile or so to the first mark Trevor and I were half tempted to turn around and head to a nearby Pub for half a pint instead! However, there was one difference from the majority of evenings/nights that I’ve been out since the late Spring, and that was the lazy intermittent swell – the remnants of the wickedly high winds that had struck 3-4 days previous to this session. This additional movement was very welcome, and in conjunction with a high tide that was decreasing in size from the highest springs (a 4.8m tide) and that would peak at 2135 (right at the end of dusk/start of darkness) I was sure he would catch a fish and a method that is attracting increasing interest from the Fly, Trout and Salmon fraternity. There are occassions when your out fishing when you just look at how the sea is reacting to the current, the eddies and the waves breaking around the rocks and think ‘I like the look of that’ and this was one of those moments. “Lets just try here Trevor, as I like the way the water is moving through that area” I said before adding, “Please can you attach that small Xorus Patchinko 100” here. As always, there was a method to my madness, and with a surface lure attached that would mimic, perfectly, a scattering bait fish I asked Trevor to cast the lure up-tide slightly and to then work it for 3 seconds and then leave it to drift in the turmoil and tide for 3 seconds, then work it again for 3 seconds and so on… We were stood on a rocky platform, effectively at the entrance to a more sheltered cove, with the idea being to allow the lure to appear like something about to flee into this very zone – somewhere that I had an inkling the bass might be lying in wait – holding just outside of the powerful flooding tide and ready to pounce. With a few tweaks to his retrieve style (administered by casting well away from the suspected ‘hot zone’ it only took 3 casts before a swirl, followed by an immediate hit for a small (1lb) bass to crash into the lure. Clearly, this was a great start but the fish wasn’t quite worthy of a ‘grip and grin’ as we had a bigger one to catch! Within this 4 hour session, Trevor was keen to learn how to correctly fish some the lure types he’d brought along (soft plastics and surface lures primarily) in addition to understanding some watercraft. Therefore, following no further action from this initial mark, we proceeded to work our way around a series of inlets and coves, some with shallow water present and some with slightly deeper water, but with both covering a multitude of wrack covered rocks, boulder fields and underwater gullies with shingle bottoms – pure bass heaven. In the shallower, more sheltered sections of coastline (about 500 yards worth) an OSP DoLive Stick here was drifted, twitched and inched back towards us delicately, while in any deeper, more turbulent water, after he’d explored it with the soft plastic on would go the diminutive ‘baby Patch’ surface lure for a search around the outer edges of the protruding rocks. Trevor retrieving a weedless soft plastic under the shadow created by the Sun setting behind us. Onto the next mark – a slight promontory set within the influence of a tidal eddy where a small group of protruding car sized rocks rise to form the archetypal bass ambushing point. It looked exceptional it has to be said, especially when the occasional run of very manageable swell waves moved through. I’d had a good rummage through Trevor’s lure boxes and had taken a shine to a surface lure I haven’t used before, but had heard a bit about (all positive) a Seaspin Pro Q 120 here. This large ‘sliding lure’ designed to worked in a zigzagging ‘walk the dog’ style is very, very easy to use. And above all, it suited the swell conditions perfectly by imitating something that had been washed out of the rocks with that ‘work it, pause for a few seconds, then work it again’ technique – something that Trevor had never tried before but that I have always utilised in similar conditions when fishing with a larger top water lure. I’ve said it many, many times, but patience and perseverance are essential when bass fishing. Yes, Trevor landed one within the first 10 minutes of the session, but he had to working overtime on this mark (we’d delayed our departure from it as it just looked so good) until literally right in between the two rocks, and just inside the frothing border of an eddy caused by the waves washing around them when BOOM! Something raced up from below and utterly nailed the lure. With Trevor’s 9′ Craft First Cast here (a fantastic piece of kit for the £109 price tag and one I’ve recommended to anglers many times) hooped over the bass stayed relatively deep in the 8ft of water as it attempted to head around the back of the left hand rock and out into the current. I’d briefed Trevor that this might happen, and by utilising his experience of landing some huge Salmon around the North Devon river systems he applied the correct amount of side strain whereby the bass boiled on the surface. It looked very ‘golden’ judging by the initial glimpse I had of it – surely a wrasse hadn’t hit a surface lure (something that I’ve never experienced although it would be very interesting to know if anyone out there has?). With my net at the ready the fish bulked at my sudden shape in its view and made another run for the two rocks (this is when I saw it again and realised it was a very nice bass) but Trevor had the upper hand by now, and with the rod held high and right he turned the bass before guiding it back towards me. In she went first time! (I’ve vastly improved my net skills since last season!). Despite measuring 55cm I estimated the weight of this beauty to be well above 4lb as she felt chucky and extremely well fed! What a fantastic looking fish she was – very dark, very broad and very angry – a real bruiser of a bass and a ‘daylight destroyer’ that really wanted its evening meal judging by the way it hammered the lure. 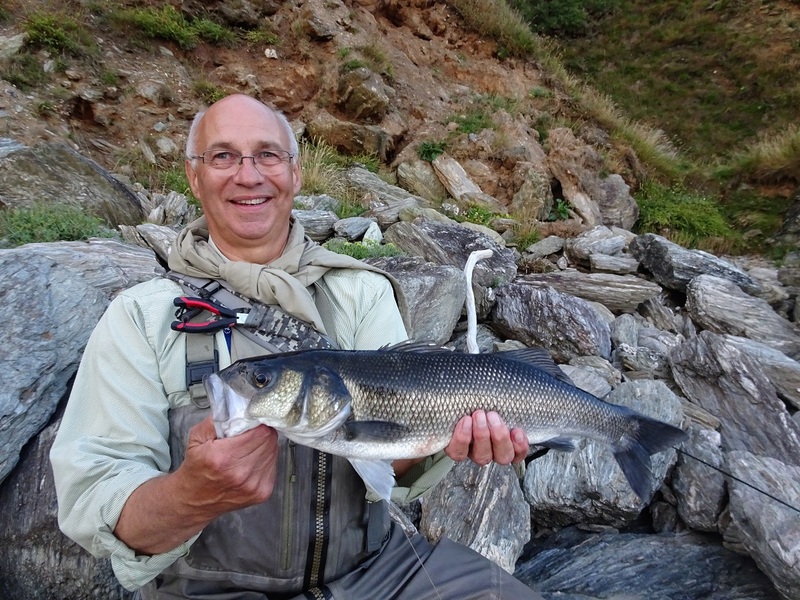 After safely returning his cracking bass we worked our back around the coves and inlets with my rather chuffed client making the odd cast into any tasty looking gullies under my direction. But with only one more splash close to his surface lure (following a cast into the entrance of a narrow gully) we gradually made our back around to a nearby cove for 30 minutes of lure fishing in darkness. With the tide having now turned I was rather surprised that Trevor only received the one hit (on an Albie Snax here) as there was a lovely swell now running as the water began to ebb off the shingle. Maybe if we’d continued we might have caught one – next time Trevor! Breathtaking scenery as dusk enters its final minutes along the South Devon coastline. 3 Clients, 3 Days Guided Bass Fishing to include 6x 4 hour sessions (day/night) and 3 Nights Accommodation at the highly rated Chillington House B+B Hotel for £499 per person. Previous Client Catches – A dream come true!